Named one of TheWall Street Journal‘s top 10 nonfiction books of 2012, Steven Ujifusa’s A Man and His Ship: America’s Greatest Naval Architect and His Quest to Build the SS United States brings William Francis Gibbs’ story to life. Wharton legal studies and business ethics professor G. Richard Shell recently sat down with Ujifusa to learn more about what inspired the author to tell Gibbs’ story, what led Gibbs to build ships and how the builder’s firm became responsible for 70% of all ships built during World War II. 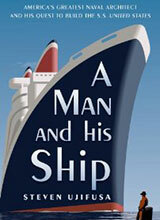 Richard Shell: A Man and His Ship was named by The Wall Street Journal as one of the top 10 nonfiction books of 2012. It’s a personal favorite of mine. I came across it while doing some research and ended up using several of the stories about the personality of William Francis Gibbs, the architect of this great ship, in a book I am writing. Steve, welcome to Knowledge@Wharton. Steven Ujifusa: Thank you so much for having me. Shell: I thought it would be interesting if we could chat a little bit, both about your journey in writing this book and also the journey you chronicle of William Francis Gibbs and his remarkable achievement in building the SS United States. How did you stumble onto this topic? What was it that prompted you to write about this remarkable man? I ended up coming to Philadelphia for graduate school and never leaving, been here ever since. Back in 2007, I started doing some freelance pieces, and one of them was on the SS United States because I had just been fascinated with it. The editor at PlanPhilly.com, a gentleman named Matt Golas, said, “We’ve always wanted to have someone write about that. How about you tell us more about the man who designed it?” It ended up evolving into a book proposal, and the book was published by Simon & Schuster after about five years of work. For me, it started off with an interest in the ship as an American icon, as a true masterpiece of American technology built at a time in the 1940s and 1950s when America was at the top of its manufacturing prowess. As one maritime historian said, this is a ship that was like a cathedral. It was built to last forever…. But then I began thinking, “Well, what about the man who created the ship?” That’s what ultimately created the book: What sort of creative person did it take to design a ship this spectacular and this strong and fast? Why did he want to build the finest, fastest social liner in the world? Then I began looking at William Francis Gibbs and discovered this man is on par with Frank Lloyd Wright or John Augustus Roebling who designed the Brooklyn Bridge — one of these individuals who uses the American industrial system, the financial system and his own creativity and vision to create not just a ship that was built to transport people from A to B, but something to transcend that, to be a floating work of art. This man was so in love with this ship that he would greet it every time the ship came to New York. Someone once asked him, “Mr. Gibbs, do you love that ship more than your wife?” He responded, “You’re 1,000% correct.” What sort of person is this? Shell: Someone who’s married to his work, I guess. Shell: Tell us a little bit about William Francis Gibbs. What led him to be interested in ships? His father was an extremely wealthy financier, very closely connected with the Weiner family and one of the richest men in Philadelphia. His father said, “That is not a good career — to be a Naval architect.” Gibbs ended up going to Harvard in preparation to be a lawyer. He proved to be a terrible engineering student and math student. He was brought up in a big mansion in Rittenhouse Square, with all the comforts and conveniences of the early 1900s Gilded Age America. But then [during] his senior year [in 1910,] his father went bankrupt, and his family lost everything. Ultimately, this was the defining event of his life. Shell: Gibbs really was a man who saw the dream very early in life when he had this experience with the ship launching and then found the motivation a little bit later while he was in college, and then spent the rest of his life essentially pursuing the dream? He ultimately finagled two connections. One was to a gentleman called Admiral David W. Taylor, who was chief constructor of the U.S. Navy and also very interested in America building up its passenger and Naval fleets at the time. Taylor ended up meeting this young, very nerdy, very socially awkward young man from Philadelphia and said, “This kid has some issues with math, but he has drive, he has talent.” Taylor ends up taking Gibbs under his wing and providing a lot of the training that Gibbs never had and a lot of the support and credentials. But then Gibbs also got introduced to JP Morgan, Jr., who was the son of the famous banker. JP Morgan, Jr., had his own issues with shipping because his father was the principal investor in the White Star Line that built the Titanic. Shell: Ah. So, all shipping stories either begin, end or go through the Titanic? Ujifusa: Oddly enough, when he was designing the ship that became the SS United States, his primary focus was, “I want this ship to be able to withstand the same damage that sank the Titanic in 1912.” That was the departure point for ship safety. He felt that a lot of shipping companies were skipping on safety for the sake of passenger comfort, for the sake of cost saving. He would later say that it is almost a crime for a company to skimp on safety for the sake of short-term cost savings because of the potential damage that could happen to a company when hundreds are killed — or in the case of the Titanic, 1500 people. It actually makes better business sense to over-engineer a ship for safety. Shell: Right. We’re having a little example of air safety, even as we do this interview, with the Boeing Dreamliner, the latest technology of the air, having not been completely, flawlessly designed and now the fleet’s on the sidelines as they figure out its battery problem. I know that William Francis Gibbs was on the cover of Time magazine in the 1940s. What brought him to the cover of Time? Ujifusa: By the 1940s, Gibbs had founded his own very successful Naval architecture firm. David W. Taylor, the famous admiral who had become partner, and his brother, who was also a partner ended up becoming the leading Navy contractors, building new Navy ships during the 1930s, during the buildup to World War II. As one of his colleagues said, “He was a great designer, but his real strength lay in project management.” He was very much a Steve Jobs figure who came up with a concept of how he wanted a ship to look, the specifications it was to have and then worked very closely with very talented subordinates, who were very good technically, to come out with the finished product. He was an utter control freak, and he also had a notorious mouth. He spoke with the diction of a Philadelphia aristocrat, but had the mouth of a sailor. He ended up getting on the cover of Time magazine because his firm was responsible for the production of the famous Liberty ships, which were the first true mass-produced cargo ships in which America’s industrial engine was thrown behind the war effort. This is a time when American could produce a liberty ship in three weeks from start to finish, prefabbing a lot of stuff off-site and then building these ships faster than Germans could sink them. That’s what landed him on the cover of Time magazine. He was called “The Technological Revolutionist.” He brought Henry Ford’s idea of mass production from cars to ships. Shell: Interesting. I seem to remember somewhere in your book that his firm ended up designing something like three-quarters of all the ships that the Americans used in the war effort. Ujifusa: Yes, his firm, Gibbs & Cox, was responsible directly or indirectly for 70% of all ships built during World War II, all Navy ships. His firm ended up becoming one of the leading military contractors.He loved passenger ship design, but he saw it didn’t really pay that much, and decided to focus on government contracts. He had a relationship with President Roosevelt who loved ships himself, and that really grew his business. He ended up employing nearly 2,000 draftsmen, designers and engineers in his firm in Lower Manhattan by the end of World War II. Shell: You mentioned Steve Jobs as a modern person with some of the same qualities that William Francis Gibbs had. Steve Jobs’ personality is now part of the public discourse because of a biography recently written by Walter Isaacson. You’ve gotten William Francis Gibbs into our imagination. What kind of person was he, and why do you compare him as a personality to Steve Jobs? Ujifusa: In many ways, Gibbs was an engineer with the soul of an artist. He was someone who had very little patience for small talk. When he was talking, he was very to the point of what he wanted. As a young man when he was just starting out as a designer, he felt that he was too nice and too meek and he felt that his ideas were getting [ignored]. In his early 30s, he had this transformation. He said, “You know what? If I want to get something done, if I want to aim for an ambitious goal, being disagreeable or even being nasty is a way of getting to a greater goal.” He would later tell his staff when they finished the SS United States, “I apologize for how I behaved. But this is like trying to build a pyramid here.” Gibbs was the sort of guy who would soundlessly sneak up on his designers when they were working — it kind of creeped them out a little bit. But he was everywhere. He kept tabs on everything everyone was doing. Shell: A controlling personality, but he knew exactly what he wanted in the end. Ujifusa: Exactly. He was a very controlling personality, and he also had a great sense of humor and loved giving speeches. Steve Jobs was, in a similar way, a very charismatic persuader for impossible ideas. Gibbs once said, “If I didn’t have a sense of humor working with ship builders, I’d have been dead a long time ago…. Everyone thinks I’m such a mean fellow because I like ships more than people.” I think it was a dig at himself, but also revealed that he was devoted to creation. Shell: Did he have the same problems with his family life as Jobs seems to have had with his? It was kind of a telling thing. I think he wanted to create his own world. Gibbs & Cox, his firm, was a very closely guarded under the context of military secrecy. There were all [kinds] of barriers to get in and get out. He once told a security guard, “Please check the identification of everyone who comes in here.” The next day, William Francis Gibbs walks in the door — this is a story that one Naval architect told me — and the security guard sees Gibbs and waves him through, and Gibbs says, “You’re fired. You should have asked me for I.D.” Jobs and Gibbs wanted to create their own little creative worlds. Shell: In the high-tech sense, trade secrets create the need for that kind of careful scrutiny and security. In Gibbs’ world, it was the government contracts and the secrets of Naval design and then his own personality that did it. Shell: I remember when I first moved to Philadelphia, going down to the docks here in Philadelphia and seeing this great, huge, hulking vessel parked on the Delaware River and wondering, “What on Earth could that be?” It said, “SS United States” on the side. Having read your book, a whole area of not just Philadelphia history, but also the history of American business and this incredibly important ship building industry that the United States was so strong in over the years really came to life. Thank you for bringing that all to us.